Firstly, the Solvy DBY RR. After I finished Mary Lewis's cream on cream block, I received this bright orange, yellow and green block from Margaret Price. Wow, this block was so challenging because these are not the sort of colours that I normally work with, however I really enjoyed myself experimenting with 3D flowers and charms. 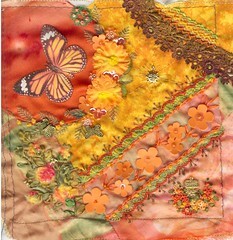 The appliqued butterfly introduced brown colour to the block so I was able to balance it up with the dyed lace and the stitchery along the sides of the sheer braid with vinyl orange flowers. The flowers around the little gold "My Garden" charm were single tatted flowers which I worked in white thread and then dyed orange and yellow.